This week I take a look at the proper method for hydrating dry yeast for beer brewing to maximize your viability and produce a healthy fermentation. While dry yeast does not offer quite the selection of liquid yeast, it does have some significant advantages as it is much easier to store, can be stored much longer, and is easier to prepare. I like to keep several packets in my fridge for the times when my schedule changes to let me brew, but I may not have several days in advance to prepare a yeast starter. Though you don’t usually need a starter when working with dry yeast, proper hydration is important and there is a process I use every time to get the best results from my dry beer yeast. When hydrating dry yeast, I like to use GoFerm, which is a yeast nutrient from Scott Laboratories specifically designed to aid in the hydration of dry yeast. GoFerm has micronutrients that the yeast cells soak up that will aid in re-hydration and also the viability of the cells. Scott Labs recommends adding GoFerm at the rate of 1.25 parts GoFerm per 1.0 part of yeast. This works out to 14.4 grams of GoFerm for a 11.5 g brewing yeast packet or 6.25 g of GoFerm for the smaller 5 g packets often used for wine. They recommend using 20x by weight of water to hydrate the GoFerm. If you do the math this is about 280 ml (9.5 oz) of water for the 11.5 g packet of yeast or 125 ml (4.2 oz) of water for the smaller 5 g yeast packets. The process I use is as follow with all amounts scaled to fit a typical 11.5 g yeast packet. If you are using smaller packets or a multiple packets you may need to scale the numbers as outlined above. Add 280 ml (9.5 oz) of luke-warm water (for 11.5 g yeast packet) at 104 F (40C) to a sanitized bowl or beaker. Mix in the 14.5 g of GoFerm until it is well blended. Next add the dry yeast packet and mix well. Let the mixture sit for 5-10 minutes, then add small amounts of wort to slowly bring the temperature down. I will repeat this process every 5-10 minutes or so – mixing in small amounts of wort to being the temperature of the mixture down. However you want to avoid changing the temperature by more than 10 degrees F within a single 5 minute period. During these breaks, I will aerate my wort thoroughly with an oxygen wand. Once the temperature is within 10 degrees F (5 C) of the temperature of the wort, you can pitch the yeast-GoFerm mixture and begin fermentation. 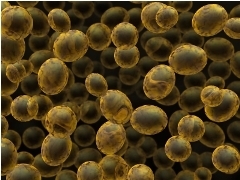 The above process will give you the best results when working with dry yeast. Thanks for joining me on the BeerSmith Home Brewing Blog. Be sure to sign up for my newsletter or my podcast (also on itunes…and youtube…and streaming radio station) for more great tips on homebrewing. Also check out the How to Brew Video series I shot with John Palmer if you want to learn more about all grain brewing. Interesting. That’s significantly higher than the temp recommended by the manufacturers, IIRC. I think Fermentis recommend 25-30C and Lallemand 30-35C. The higher temps work well with the GoFerm and I believe help the yeast as well.